Ruth Ellen Gruber writes on her blog that the Jewish Museum in Berlin has received its 5 millionth visitor since the museum opened in September 2001. Ruth writes “even before its formal opening, the empty building was a tourist draw because of its distinctive design by Daniel Libeskind." "According to the Berlin newspaper Tagesspiegel, the museum is the fifth most popular museum in Berlin, with 733,000 visitors in 2007 -- including 140,000 under the age of 18. (The Pergamon Museum holds the top spot with 1.3 million visitors). About two-thirds of visitors to the Jewish Museum come from outside of Germany. The Museum is many things to many people. For some, it remains the most compelling Holocaust monument in Germany, and there remain many (sometimes I can be counted among them) who wish the building had remained empty as a memorial and that the Peter Eisenman-designed monument had not been built. Indeed, a good number of those 5 million visitors came to the building even before the museum was installed. Most of the time I wish, as do many visitors and staff, that the Libeskind design could have been more accommodating to the musuem exhibits. I have not visited the Museum for several years, but my overall impression was of a permanent exhibit that was contorted and disjointed, in large part because of the difficult spaces in which it was forced. But that too was the result of an unclear and uncertain story line. Whose Jews to commemorate. Berlin's or Germany's or Europe's? What history? Big cities or small towns? Rabbis or cafe raconteurs? What was important - history or art? Originals or replicas? I know that the staff has been trying hard for years to work all of this out. I hope on my next visit to Germany to have time to revisit and reconsider. As for the Libeskind space, in the end the staff's best efforts will have be confined to the more traditional exhibition spaces of the old History Museum, rather than the expressive and haunting spaces of the Zigzag. Libeskind's type of space worked well in Osnabruck, where a small number of works by Felix Nussbaum are given lots of space, and the architecture is part of the narrative. To me, this small space remains Libeskind's most successful work. It is appropriately disconcerting and disorienting, but somehow remains humane. Like Berlin, Libeskind's Imperial War Museum in Manchester, England is difficult to navigate, but the disorientation there is in part due to murky lighting and unnecessary special effects, that for me undermined both architecture and exhibitions. At Manchester, the best experience was actually the liberating one of climbing on the outside of the building. I look forward to a trip to San Francisco, to see what musuem curators have to confront with there. 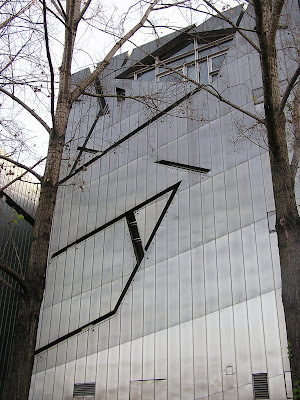 photos of the Jewish Museum in Berlin by Samuel D. Gruber (2003).